If you have any online shopping or account queries, please CONTACT US on 0860 834 834. Standard: 3-5 working days. Express: 2 working days. Overnight Express: next working day, when ordered before 2pm, Mon-Thurs. Express & Overnight Express: only offered in JHB, CPT & DBN. Pargo Pick-up: conveniently collect your parcel at 1 of over 400 local Pick-up Points. Collect in Store: Collect your order from one of our nearby stores. 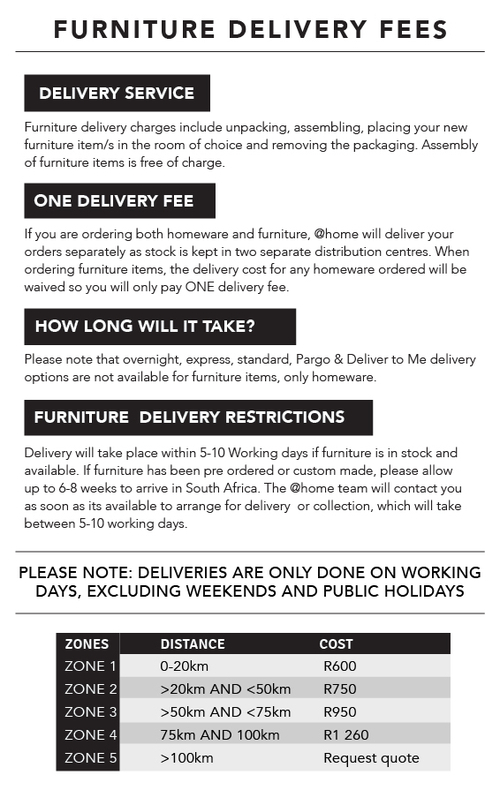 Refer to delivery & returns here for furniture. If you are not completely happy with your purchase you can return it to your closest store (excluding furniture) for free! Or call our contact centre on 0861 111 761 and we’ll arrange a courier to collect (including furniture). Click here for our delivery & returns information. Thank you! We have now captured your ‘email me’ request and will notify you regarding the stock. Please complete the fields below and we"ll send your friend an email. Your wishlist has been sent. The quantity you requested exceeds the limit. Please check and try again.